In a large pot, heat the oil over moderately low heat. Add the onion and bell pepper and cook, stirring occasionally, until starting to soften, about 4 minutes. Stir in the paprika, coriander, cayenne, ginger, cinnamon, black pepper, and 1 teaspoon of the salt. Add the broth, tomatoes, and sweet potatoes. Simmer until the potatoes are almost tender, about 15 minutes. Meanwhile, in a medium saucepan, bring the water and 3/4 teaspoon of the salt to a boil. Stir in the couscous. Cover, remove from the heat, and let sit for 5 minutes. 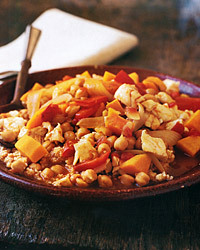 Stir the chickpeas, fish, and the remaining 1/2 teaspoon salt into the sweet-potato mixture. Simmer until the fish is just done, about 4 minutes. Serve the fish and vegetables over the couscous. Ladle the liquid over the top. Fish Alternatives Skinless red snapper, black cod, and tilefish fillets would all be good with this couscous. The earthy but exotic flavors here invite a cold bottle of Rosé. Look for one from Provence in southern France, or, if you like a bit of sweetness, try a White Zinfandel from California.